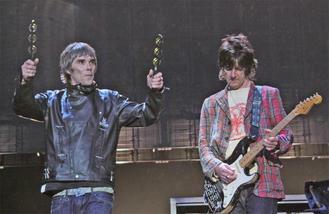 The Stone Roses have cancelled two shows in Tokyo after drummer Alan 'Reni' Wren suffered a fall and fractured two ribs. The 52-year-old musician - who is joined in the band by singer Ian Brown, guitarist John Squire and bassist Gary 'Mani' Mounfield - accidentally fell over, cracking the bones and medical professionals have advised him to "rest for at least a month", forcing the 'I Wanna Be Adored' hitmakers to pull the forthcoming concerts at the Japanese city's Nippon Budokan arena on June 2 and June 3. Promoters Creative Man have issued a statement on their website - creativeman.co.jp - explaining why The Stone Roses pulled the forthcoming concerts. The statement reads: "The Stone Roses are very sorry to have to cancel their two proposed concerts at the Budokan. Reni has had an accidental fall and fractured two ribs, his doctor has told him to rest for at least a month. Unfortunately this means that the band are unable to fulfil their planned performance in Japan." The 'Fool's Gold' rockers have been tucked away working on their highly anticipated third studio LP for the past several months at Paul Epworth's The Church Studios in north London. They are scheduled to perform four massive open air concerts at Manchester City's Etihad Stadium next month and they will also travel to Dublin and New York, as well as headlining the T in The Park festival in Scotland. The band have also pulled the Tokyo dates from their website, but are yet to release a statement themselves regarding the cancelled shows. Teasing what the new album is sounding like, frontman Brown said "glorious" and promised it would be coming out "soon", potentially in time for the band's massive summer shows. Lady Gaga has hailed Kesha's moving cover of her emotionally-charged sexual abuse song Til It Happens To You. Kim Kardashian treated to private string orchestra on Mother's Day. Iggy Pop admits some of his rock contemporaries are starting to look a bit ridiculous. Britney Spears has written a touching tribute to her two young sons ahead of America's Mother's Day on Sunday (08May16). Corinne Bailey Rae felt she had "nothing to live for" after her husband died. Snoop Dogg wants to come back as a butterfly in his next life. A California judge has ordered a mental evaluation for a woman accused of trespassing twice on Chris Brown's property. Prince assured his closest friends and associates he was fine days before his death. Harry Styles has set social media alight by cutting his hair.